Fusion power is power generated by nuclear fusion processes. 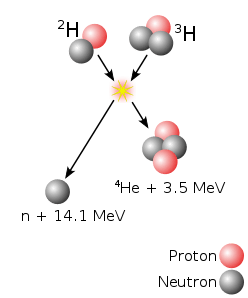 In fusion reactions two light atomic nuclei fuse together to form a heavier nucleus. During the process a comparatively large amount of energy is released. The term “fusion power” is commonly used to refer to potential commercial production of usable power from a fusion source, comparable to the usage of the term “steam power”. Heat from the fusion reactions is utilized to operate a steam turbine which in turn drives electrical generators, similar to the process used in fossil fuel and nuclear fission power stations. Fusion power has significant safety advantages in comparison with current power stations based on nuclear fission. Fusion only takes place under very limited and controlled conditions So, a failure of precise control or pause of fueling quickly shuts down fusion power reactions. There is no possibility of runaway heat build-up or large-scale release of radioactivity, little or no atmospheric pollution. Furthermore, the power source comprises light elements in small quantities, which are easily obtained and largely harmless to life, the waste products are short-lived in terms of radioactivity. Finally, there is little overlap with nuclear weapons technology. 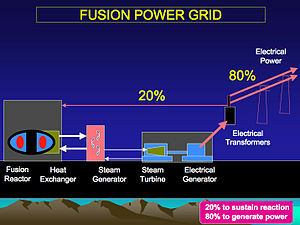 Fusion powered electricity generation was initially believed to be readily achievable, as fission power had been. However, the extreme requirements for continuous reactions and plasma containment led to projections which were extended by several decades. More than 60 years after the first attempts, commercial fusion power production is still believed to be unlikely before 2040. The leading designs for controlled fusion research use magnetic (tokamak design) or inertial (laser) confinement of a plasma. The tokamak (see also Number 29 – Easy such and so / April 2011, Nuclear power – tokamaks), using magnetic confinement of a plasma, dominates modern research. Very large projects like ITER (see also The Project ITER – past and present) are expected to pass several important turning points toward commercial power production, including a burning plasma with long burn times, high power output, and online fueling. There are no guarantees that the project will be successful. Unfortunately, previous generations of tokamak machines have revealed new problems many times. But the entire field of high temperature plasmas is much better understood now than formerly. So, ITER is optimistically considered to meet its goals. If successful, ITER would be followed by a “commercial demonstrator” system. The system is supposed to be similar in purpose to the very earliest power-producing fission reactors built in the period before wide-scale commercial deployment of larger machines started in the 1960s and 1970s. Stellarators, which also use magnetic confinement of a plasma, are the earliest controlled fusion devices. The stellator was invented by Lyman Spitzer in 1950 and built the next year at what later became the Princeton Plasma Physics Laboratory. The name “stellarator” originates from the possibility of harnessing the power source of the sun, a stellar object. Stellarators were popular in the 1950s and 60s, but the much better results from tokamak designs led to their falling from favor in the 1970s. More recently, in the 1990s, problems with the tokamak concept have led to renewed interest in the stellarator design, and a number of new devices have been built. Some important modern stellarator experiments are Wendelstein, in Germany, and the Large Helical Device, inJapan. Inertial confinement fusion (ICF) is a process where nuclear fusion reactions are initiated by heating and compressing a fuel target, typically in the form of a pellet. The pellets most often contain a mixture of deuterium and tritium. 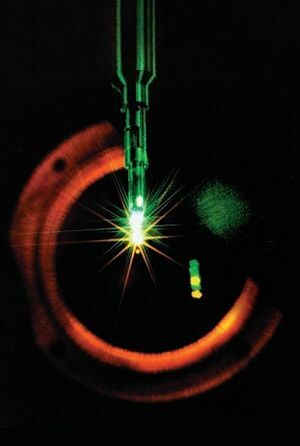 To compress and heat the fuel, energy is delivered to the outer layer of the target using high-energy beams of laser light, electrons or ions, although for a variety of reasons, almost all ICF devices to date have used lasers. The aim of ICF is to produce a state known as “ignition”, where this heating process causes a chain reaction that burns a significant portion of the fuel. Typical fuel pellets are about the size of a pinhead and contain around 10 milligrams of fuel. In practice, only a small proportion of this fuel will undergo fusion, but if all this fuel were consumed it would release the energy equivalent to burning a barrel of oil. To date most of the work in ICF has been carried out in Franceand the United States, and generally has seen less development effort than magnetic approaches. Two large projects are currently underway, the Laser Mégajoule in France and the National Ignition Facility in theUnited States. All functioning fusion reactors are listed in eFusion experimental devices classified by a confinement method.